SILICON SLOPES, UT--(Marketwired - Sep 8, 2015) - Today, InsideSales.com announced the Predictive Cloud™, a first-of-its-kind open platform that enables businesses of all sizes to build rich, powerful predictive apps that drive business results. Powered by the proven Neuralytics™ self-learning predictive engine, the Predictive Cloud taps into the intelligence gathered from analyzing nearly 100 billion sales interactions. The Predictive Cloud represents the evolution of big data applications for businesses, allowing companies to realize the full potential of predictive technologies in their own applications, business processes, and sales practices. Predictive-as-a-Platform - Through the Predictive Cloud Open API, independent software vendors (ISVs) can tap into the Predictive Cloud to add predictive functionality into their own apps. Predictive-as-a-Service - Companies can leverage the Predictive Cloud to scale revenue and improve internal processes and operations. Sales Acceleration Apps - Thousands of companies are already leveraging the power of the Predictive Cloud to accelerate sales via InsideSales.com Sales Acceleration apps for sales communications, email and web tracking, predictive forecasting, lead and opportunity scoring, sales gamification, and sales hiring. More information is available here. "The vision for the Predictive Cloud dates back to the founding of the company in 2004," said Dave Elkington, founder and CEO, InsideSales.com. "We are building an Amazon-style recommendation engine for business -- a system capable of intelligently analyzing billions of data points in real-time and recommending the optimal next steps for almost any application or business process. This lays the groundwork for a future where predictive technology can be applied not just to sales organizations, but also to government, healthcare, retail and beyond." In her July 2015 report, "CRM Sales Automation Software for Every User," Kate Leggett, vice president and principal analyst at Forrester Research, noted: "Solutions in the sales acceleration category speed prospects' progress through the sales funnel through prescriptive insights. These take the insights driven by predictive analytics and layer on domain-specific business logic resulting in context-specific, actionable prompts for individual salespeople." 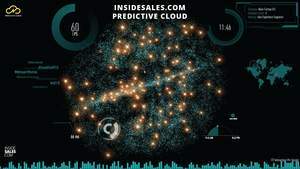 The Predictive Cloud analyzes nearly 100 billion sales interactions and is powered by InsideSales.com's Neuralytics engine, a real-time, self-learning predictive engine that incorporates advanced learning algorithms to analyze data and provide intelligent recommendations. This self-learning capability means that all transactions are automatically captured and continuously refreshed, providing a tight feedback model between actions and results to enhance the predictive power of the system. Data from the Predictive Cloud is combined with anonymized customer data, then correlated and enriched with external data sources, creating "High-Definition" Data to increase predictive accuracy. Cloudbilt, the makers of MapAnything, is integrating with the Predictive Cloud to add individual NeuralScores (likelihood of a lead to close a sale) to its app, helping joint customers leverage predictive insights to prioritize effectively and ensure time spent in the field impacts the bottom line. CloudCraze, an enterprise e-Commerce platform native on the Salesforce platform, is using the Predictive Cloud to help their customers sell more through their ecommerce engine by applying prescriptive new product recommendations and optimized replenishment orders. Demandbase, a leading provider of account-based marketing solutions, is leveraging the Predictive Cloud to improve customers' ability to reach high-value accounts with advertising across the web. Dynamic Signal, an employee advocacy platform, is using the Predictive Cloud to identify the timing and optimal channels for social sharing to achieve optimal results. Eventboard, a cloud-based meeting productivity management and collaboration analytics platform, is leveraging the Predictive Cloud to analyze the predictive relationship between meeting room and collaboration technology usage, and sales team productivity and outcomes. LogMeIn, a software-as-a-service (SaaS) company simplifying the way people connect to each other and the world around them, is engaged in a proof of concept to leverage the Predictive Cloud in their join.me online collaboration business to identify the leads best suited for the advanced features of their premium edition. "Our popular meeting and collaboration product, join.me, attracts more than a million first time free users every month, many of those are sales people looking for an edge in making great presentations to prospects. At this extreme scale, data science is critical in matching the right product to the right customer," said Larry D'Angelo, senior vice president of sales at LogMeIn, a company actively involved in a Predictive Cloud proof of concept project. "As an InsideSales.com customer, we see a lot of promise in Predictive Cloud. It's taking analytics to a new level we believe can ultimately boost sales productivity." "In many ways, the promise of analyzing data is only starting to be realized in a business context," said Mark Gorenberg, Zetta Venture Partners. "InsideSales.com has shown time and again that they have the right formula to accelerate sales, but the Predictive Cloud is where they'll prove that their technology can be applied across an entire organization to bring operations, applications and more into a new era of operational efficiency and sustainable success." This has been a record year of growth for InsideSales.com. Having hired top executive talent including chief customer officer and president of worldwide sales Jim Steele and expanded its company footprint beyond U.S. borders in London, InsideSales.com has grown to more than 700 employees. This spring, the company closed a $60M strategic funding round led by Salesforce with Microsoft and announced its acquisition of C9 Inc. to bring its predictive cloud platform to the entire sales funnel. InsideSales.com's Predictive Cloud is available under tech preview to select partners, with a broader public launch anticipated in 2016. Dreamforce attendees can see the Predictive Cloud firsthand at InsideSales.com's booth, N1409. To add your company to the tech preview wait list, please visit www.predictivecloud.com. InsideSales.com offers the industry's leading sales acceleration platform built on Neuralytics, a predictive and prescriptive self-learning engine that drives revenue growth by delivering an optimized experience for both salesperson and buyer. The platform fuels sales rep performance and provides buyer personalization with breakthrough innovations in predictive sales communications, gamification and hiring. InsideSales.com has received numerous accolades for its technology and has been named as one of the fastest growing companies by Inc. InsideSales.com enterprise customers include ADP, Microsoft, Groupon and Zenefits. "The combination of our industry-leading account-based targeting technologies and the power of the Predictive Cloud has the potential to reshape the $40B B2B marketing landscape," said Chris Golec, founder and CEO of Demandbase. "Our customers have already seen immense value in targeting specific accounts in their advertising and other marketing activities. By accessing the predictive analytics and machine learning of the Predictive Cloud, our customers will be able to prioritize ad spend to focus on those accounts most likely to buy." "The vast pool of data and analytics that powers the Predictive Cloud is staggering and will allow our joint customers to take field sales to the next level," said John Stewart, CEO at Cloudbilt. "With InsideSales.com's NeuralScore, we are now able to incorporate a lead's likelihood to close with the geo-context provided by MapAnything. We believe the combined offering of MapAnything and the Predictive Cloud provides our mutual customers with a unique value proposition and we are looking forward to leveraging the platform in new and innovative ways in the future." "The data and analytics behind the Predictive Cloud provides a platform for success," said Russ Fradin, CEO at Dynamic Signal. "We have been able to leverage the predictive capabilities of Neuralytics to analyze the outcome of social sharing in order to recommend which channels and distribution times will best maximize the power of our customers' employee advocacy programs. By bringing the power of predictive to social engagement, we are able to take employee social media to new heights for our customers." "As we've been looking to add predictive capabilities to our enterprise commerce platform, we've been searching for a partner that brings together expertise with the Salesforce platform, predictive analytics and machine learning, along with a proven track record of success," said Andrew Witherspoon, executive vice president at CloudCraze. "InsideSales.com has a strong track record of successful, customer-focused implementations of predictive solutions across a variety of settings. We believe that by combining the Salesforce CRM data with traditional commerce data and then adding predictive analytics and machine learning, we can create a powerful solution we call contextual commerce. With our global CPG brand customers, we have seen significant increases in revenue growth and customer satisfaction for companies using our platform to deliver contextual commerce." "Leveraging the power of InsideSales.com data and predictive analytics allows us to uncover key insights into how a sales team meets and their potential impact on sales productivity and results," said Brian Bond, vice president of marketing at EventBoard. "With this information at our fingertips, we can improve and broaden the capabilities of our software, increasing our customers' sales effectiveness and, ultimately, their bottom line." The Predictive Cloud analyzes nearly 100 billion sales interactions and is powered by InsideSales.com’s Neuralytics(TM) engine, a real-time, self-learning predictive engine that incorporates advanced learning algorithms to analyze data and provide intelligent recommendations.